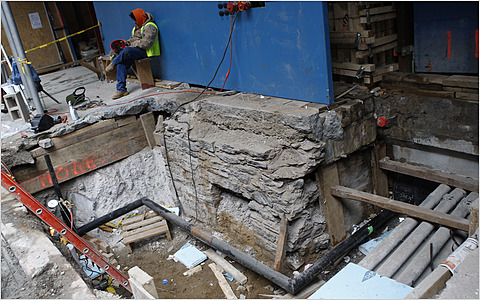 Renovations at 11 Times Square recently revealed a group of tightly packed stones at the base of the building. It was heartening to note that people appeared to take interest in the unusual architecture, wondering at the origins and purpose of the stones. Urban archaeologist Joan H. Geismar who initially proposed that the structure was the remnants of a coal vault from the 1800s. Upon closer examination, Geismar indicated that the structure wasn't what she was expecting if it had indeed been a coal vault. Geismar later discovered that the structure was perhaps the foundation of a theater that stood at that location at about 1890. The developer has indicated that workers will recover the stones and leave them as is—to be discovered by future developers. One reader suggested that it was a gift for the future. I wonder at this. Can we trust future historians, archaeologists, and officials to protect what is uncovered, or should steps have been taken to secure this site? Share your thoughts below, and on this holiday, I'm pleased to share with you this secret "gift" that lies below 11 Times Square.